Private over-water bungalows on a beautiful secluded beach. Coral gardens, dolphins, and Eclectus parrots. 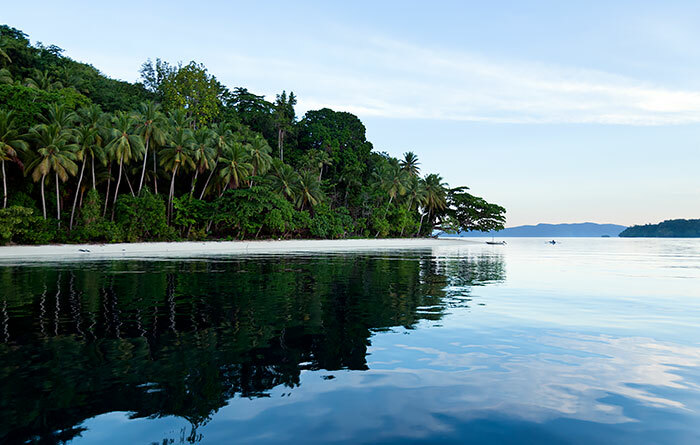 A picture-perfect Pulau Friwen hideaway. 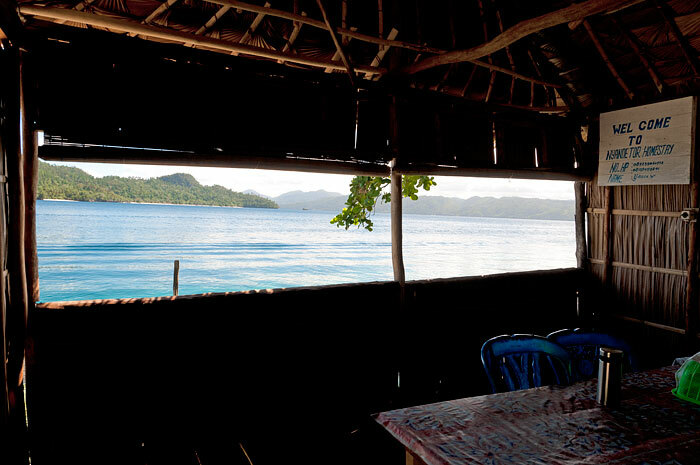 Nyandetor Homestay is located in a quiet and beautiful secluded bay on north shore of Pulau Friwen. There is a three room bungalow on land and two single room private bungalows on the beach. Both are over water at high tide. All bungalows have verandahs on which two chairs and a small table are provided for each room. 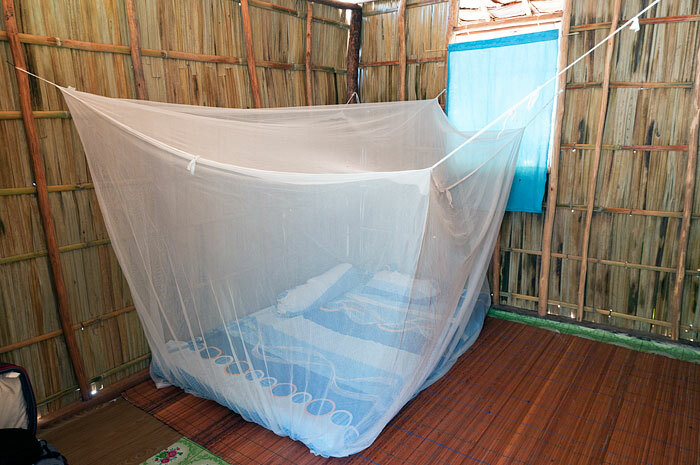 Mattresses on the floor are equipped with sheets, pillows, bolsters and mosquito nets. All rooms have power outlets and room light switches. Guest meals are served in the over water dining room which has great views across to Gam and the entrance to Kabui Bay. Drinking water, tea and coffee are always available in the dining room, which is also well positioned to make the best of sunset views. Power outlets for charging devices are also available in the dining room. 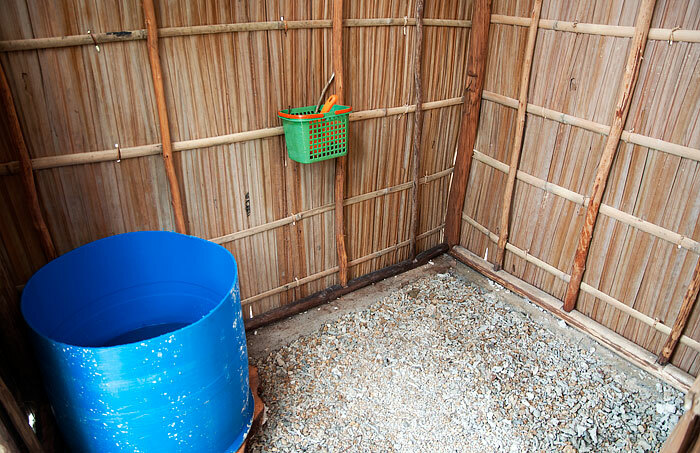 A pebble-floored dip mandi bathroom and western style toilet are provided in a partitioned bathroom building set back from the beach. 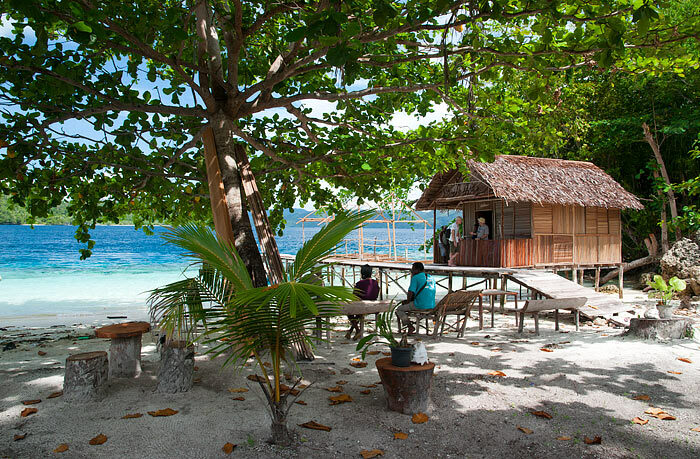 An assortment of stools, bench seats, small tables and a wooden recliner provide for beachside relaxation in the shade of a large tree by the homestay. Electricity is provided by generator from sunset until around midnight. There’s only a weak cell phone signal at Nyandetor, but it can be improved dramatically by taking a short walk to the end of the Friwen village jetty. Although Nyandetor’s location is secluded, it’s right next to Friwen village where basic supplies can be purchased. Nyandetor owner Yanse Wawiyai and his family live in Friwen village, so most of the time you’ll have the place to yourself. Only very basic English is spoken at Nyandetor Homestay, so bringing a phrasebook is a good idea if you don’t speak Bahasa Indonesia. In the unlikely event of communication difficulties you can’t solve, you’ll be able to find an English speaker in the village to help out. Transport between Waisai and Nyandetor Homestay costs IDR 400,000 each way. A longboat capable of carrying up to 8 people is used and the cost is shared by passengers. The table below gives Nyandetor transfer and pickup prices to/from other locations. Prices are in Indonesian Rupiah and cost is shared by boat passengers. It’s all about the ocean at Nyandetor Homestay. Dolphins cruise the waters beyong the rich house reef every day. The sandy bottom inshore from the house reef is home to an unusual species of colourful scorpionfish that conceals itself in the sand. In the afternoons, frigatebirds often gather above the strait between Friwen and Gam to steal fish from other seabirds and occasionally dive for their own. 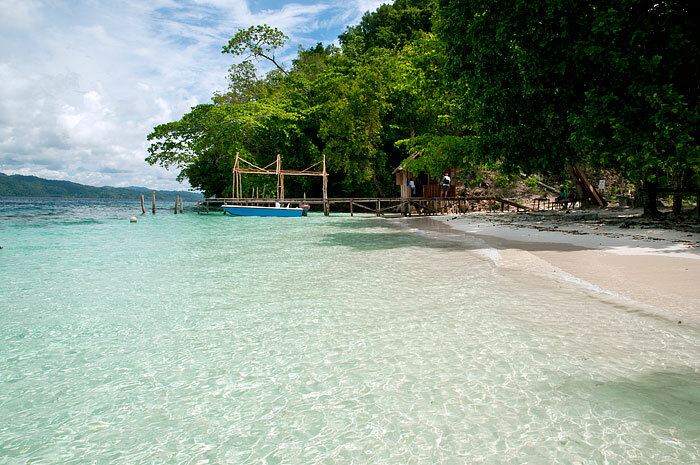 Relax on the beach and watch the changing ocean moods between Friwen, Gam and Waigeo, snorkel the coral gardens at the homestay door or explore the reef that fringes the series of small bays between the homestay and the eastern end of the island. 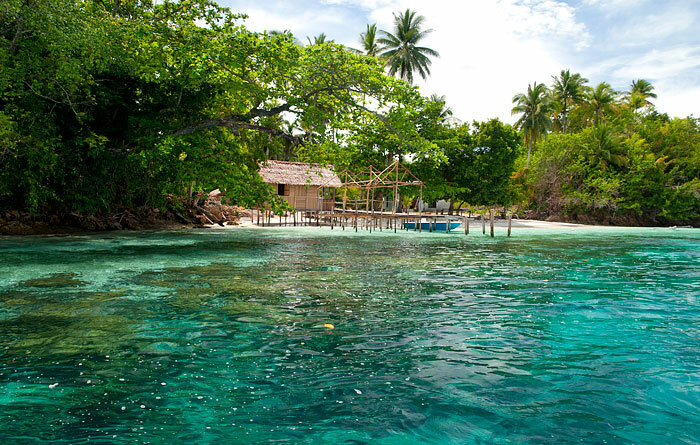 Great snorkelling with huge schools of juvenile fish can be had at the nearby village jetty and Nyandetor can arrange longboat tours to snorkel the famed Friwen Wall as well as tours further afield to snorkel with Mantas or visit other islands and sights. Diving is available in conjunction with Kordiris Homestay. A few of the many possible trips are listed below. Prices are in IDR and trip cost is shared by boat passengers. When you’ve spent enough time in the water, the land has plenty to offer too. 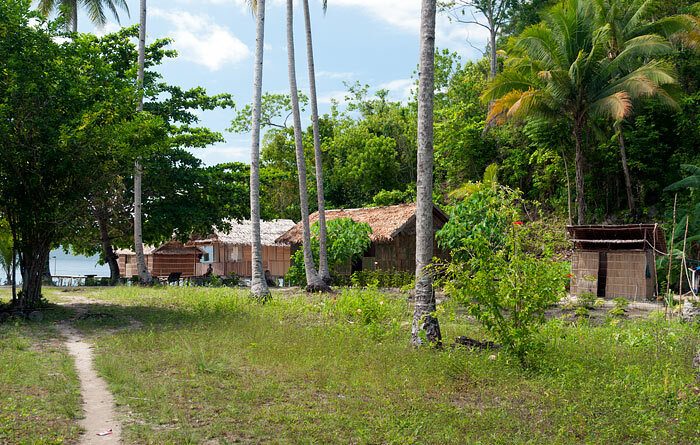 Explore Friwen village and discover trails through sago and coconut plantations and jungle to island’s many bays and viewpoints. Cross to the southern side of the island and watch the sunset light up the limestone cliffs of Friwenbonda (Friwen Wall). Huge black Palm cockatoos and brightly coloured Eclectus parrots are frequent visitors to Nyandetor Homestay – especially when the big Ketapang (beach almond) tree next to the homestay has fruit. Nyandetor can arrange longboat tours to see Red Birds of Paradise near Yenbeser on Gam, or to any of the other Dampier Strait or Kabui Bay sights you’d like to visit. See our Friwen Island page for an overview of the island and its attractions. A wonderful place! Very simple but comfortable bungalows, always clean bathroom. Good food and different every day. Lobert and his family are very kind. They don’t speak English but with Google translate everything to solve. The tours have great prices. 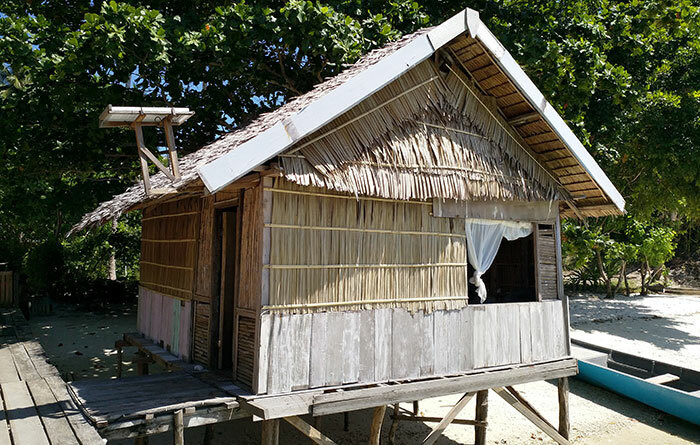 Very nice little homestay – they usually only rent the two over water bungalows. Really friendly host family. 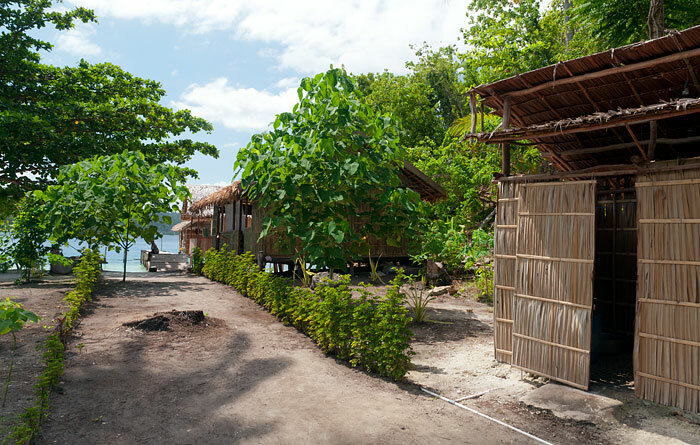 The bungalows are spacious with all the basics you need. 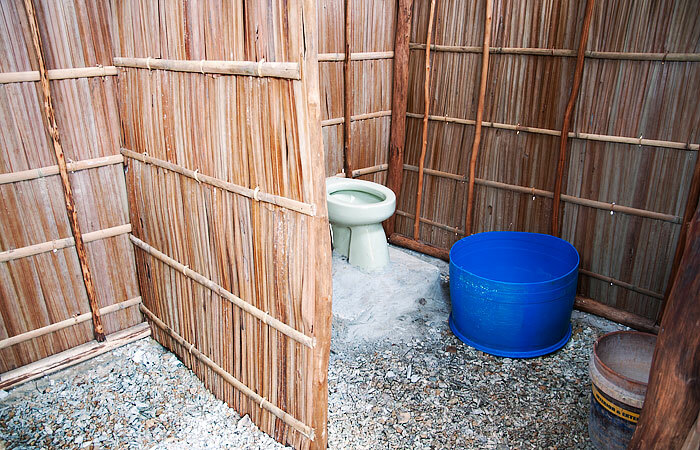 The outside bathroom hut was clean. The food which is offered in a restaurant with a beautiful view to Gam was always ok and there is a small shop (bintang, cookies…) just 30 m away. The deck at the end of the jetty is a wonderful place to relax in the sun and behind the nice little beach to the left there is good snorkeling to the village jetty and further on. Robert offers boat trips at fair prices – Batu Lima and Friwen Wall (afternoon!) are really worth a visit. As they sometimes have their phones off, it’s a good idea to tell them one day in advance which ferry you will be on if you expect a pick up in Waisai. We stayed at Nyandetor last Christmas for two nights. A lovely place to chill, very quiet with a white powder sand beach. The whole property including beach area and surroundings as well as bathroom and bungalows are kept very clean and tidy. No trash on the beach nor in the sea during our stay. 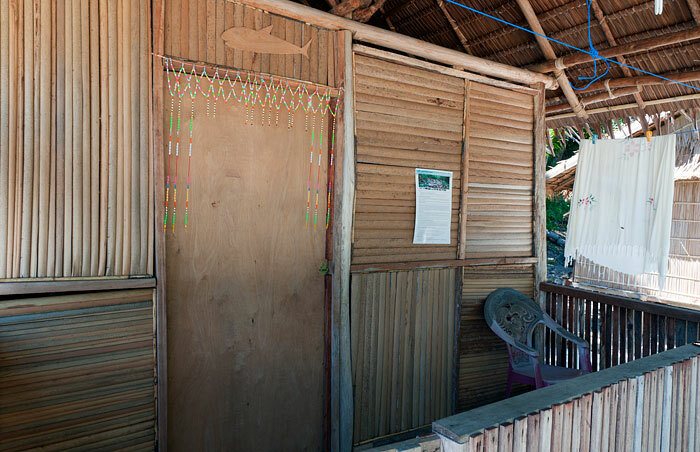 The bathroom and the bungalow we stayed in are functional and very spacious (with a small desk, hangers, hooks and ropes to hang up your clothes) and the dining area has a stunning view over the sea towards Gam island. Mattress was quite good compared to the other homestays we stayed, although not very wide for two people. The food was delicious and some clementines and bananas were available throughout the day. There is a nice hammock to chill on the beach and a great plus is the great jetty with it’s two wooden sunbeds. Everything worked out smoothly with Lobert and Tina. We definitely recommend this place. Friwen island and it’s village as a whole are a very pleasant place to stay more than just two nights. …sorry we forgot the stars. I explored several islands of Raja Ampat and I think Friwen is the best island. A little gem to explore! If you want to stay in a real homestay Nyandetor is the right place for you. Basic bungalows, clean bathroom. The coral reef is visible directly from the jetty. Beautiful white sandy beach shaded. Zero plastic in the sea and on the beach. The view is spectacular. An oasis of peace and tranquility, with a wonderful silence. The owner Robert seems a bit grumpy, but in reality he is a very nice and kind person. Always available for guests. He speaks little English but with Google translate communicating is easy. Particularly attentive to the safety of the excursions and guests. It has a boat with 2 new engines!! It is possible to do excursions within a short distance, I recommend not to miss the one at Kabui Bay. There is also the Telkomsel 4g signal. This is the place I have left in my heart!!! 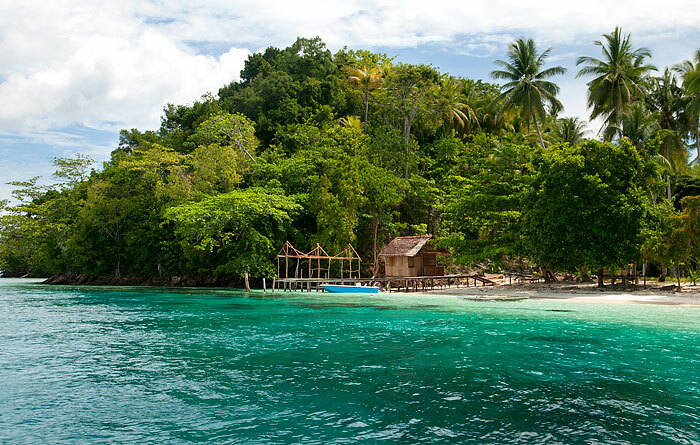 Nyandetor is a great place to start or end your Raja Ampat adventures. Very close to Waisai which is why I booked it so we didn’t have any panic trying to get to the ferry early morning on our last day. What we loved about this place was the sheer number of fish under the jetty, it was really incredible. We met a couple who stayed there the previous year and said it wasn’t like that then so maybe we were lucky. Every morning and evening you could sit on the jetty and watch the small cuttlefish coming to hunt the fish. Robert was happy to take us to 2 great local snorkel spots, including Friwen wall and we also enjoyed snorkelling from the homestay in both directions. Food was good and the room was ok.
1. star: ROBERT is a polite and shy man. He bought extra torches in waisai and came with us snorkelling in the night, thank you very much. There is one overwater bungalow what is the best option. The others come with a soft matrace on the floor and bigger holes in the moskitonets. The bathroom was clean. Most days standard RA tourist food (waterspinach without spices, boiled eggs in ketchup sauce, fried tofu or tempe, rice) was served. We got fresh fisch every second day. 2. star for a nice reef with a lot of healthy soft and hard corals to the right of the peer looking towards gam, especially nice for the night snorkelling (big crabs of any color, decorator crabs, lobsters out of the holes and udang kipas, walking sharks, shrimps, kalamars and sepias). 3. star for trips to Manta point and Mioskon. However we found it a bit sad that we made the 500 meters trip to friwen wall in the morning so the colorfull fans were in the shade. Make sure you go in the afternoon. Its really worth to see it in brighter light. We had a wonderfull stay at Nyandetor homestay! Owners always smiling and willing to help. We’ve heard that sometimes there are problems with the food at other homestays, but Nyandetor was fantastic. Fresh fish and vegetables always on-time. 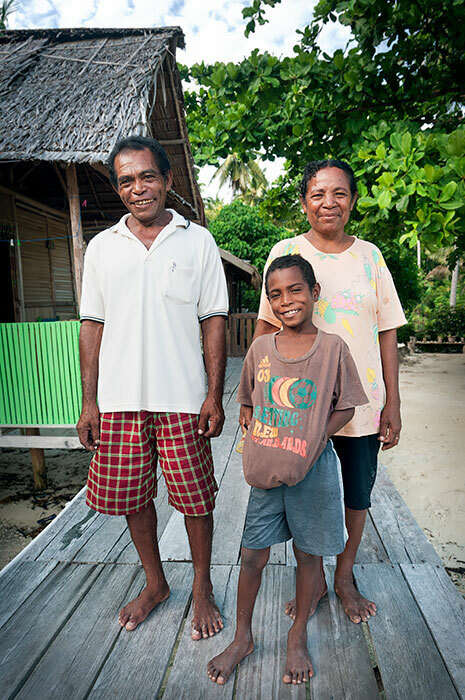 I’m really happy that there are people like this family in Raja Ampat. We stayed four nights with Robert, Tina, Yanci and Rio. Very friendly family! Tina cooked delicious food and Robert organized snorkling trips. Note that the family do not speak English. So, bring a phrasebook. We went on snorkling trips to Friwen Wall, which is a five-minute boat ride from the homestay, and to Arborek (Manta spot) a couple of hours away. Prices were very fair. 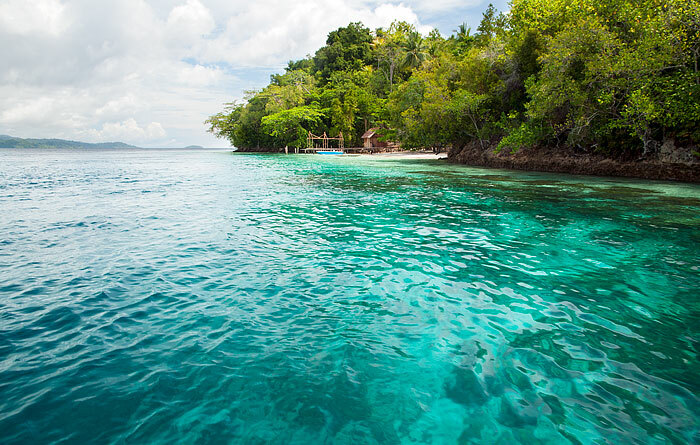 We also snorkled by the homestay, where there are some corals. Probably the best thing about this homestay is the jetty. During day, we spent hours sitting on the jetty watching the many fish swimming around the corals. We even saw a big walking shark (karabia in bahasa papua) just under the jetty. During night, we spent hours watching the stars. Hi, we are going to Nyandetor next week. Do they have snorkels to rent? Very nice homestay. I stayed 3 nights and enjoyed every bit of the time there. Lobert (the owner) and the rest of the family are lovely. Always smiling whenever they see me. And yes, the food was excellent cooked by his mother. Always enough. Bungalow is good size and comfortable. Good snorkeling in front of homestay. Went to Friwen Wall snorkeling and saw some big puffer fish and nice soft corals. Walk around the village and talk to some villagers. Good way of getting to know more of how they live on this tiny island. Lobert speaks little English but we didn’t have any problem of understanding each other. So don’t let this put you off. Highly recommend. Thanks Lobert & family for the hospitality. Looking forward to stay here next time I’m back. Very well organised place, nice house reef, nice hosts. Negotiate prices of boat transfers and trips in advance and exactly what they include so that you don’t get any unpleasant surprises after. My friend and I stayed for 4 nights at this homestay. We were touched by how well we were looked after by Lobert, Tina and the rest of this lovely and genuine family. We paid for the snorkelling to the Friwen wall that I found fabulous, with vibrant- coloured corals and great variety of fish. We also went to the manta point and saw 5 or 6, a memorable experience. Lobert organised our birds of paradise tour in Gam island, we saw red birds of paradise, wild cockatoos, hornbills and a cuscus!. We loved Tina’s cooking and specially the sweets and cakes. Also delicious fish right out of the sea. The room was comfortable enough. What felt more special to me was to be able to snorkel right from the property jetty and to be close enough to the village to be able to interact with the locals and the playful kids. We loved it. Strongly recommended. A word of caution is that the speak very basic English and a translation device will help you a lot. 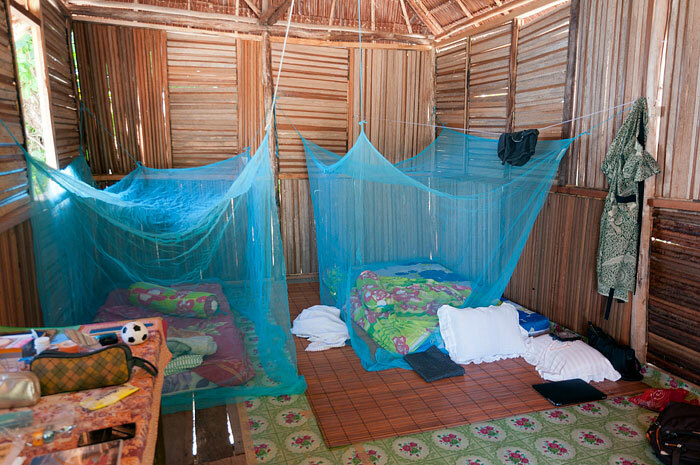 We loved Nyandetor Homestay and this is why. First of all, they were not expecting us. Another homestay forgot our reservation and we were dropped off at Nyandetor to see if they could accommodate. This was fairly late in the evening and they jumped into gear and fixed up an overwater hut for us that was wonderful. The family was exceptionally kind and we stayed there for two nights enjoying the house reef, and an excursion to the nearby Friwen Wall. Food was plentiful and enjoyed in the overwater dining pavilion, and the dip mandi was very clean. It was just a short walk to the village and down the beach to a local seaside market where my husband enjoyed a fresh coconut water. We really appreciated this homestay for the lovely location, the lovely accommodations and mostly, for the lovely family. My husband and I visited Raja Ampat in February of 2018. We stayed at two homestays while there; Nyandetor and Rawe Rawe (just off the coast of Batanta). We chose Batanta for its remoteness and Nyandetor for its proximity to the Friwen Wall which we had heard was absolutely beautiful. We weren’t disappointed in either case! Nyandetor is situated on the northern side of Friwen Island. It consists of two overwater guest bungalows, one overwater dining hut and a fourth bungalow behind on the beach with three guest rooms. We were in the overwater bungalow behind the dining area. The room was large and the bed was comfortable. 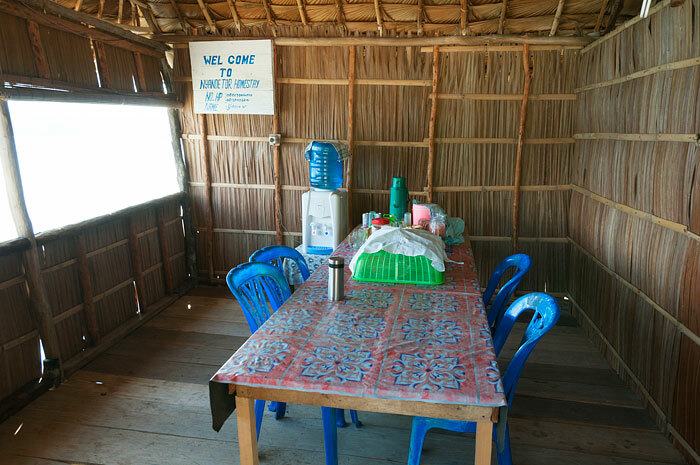 Our bungalow included some clothes lines which were convenient, a table near the electrical outlets and two chairs. 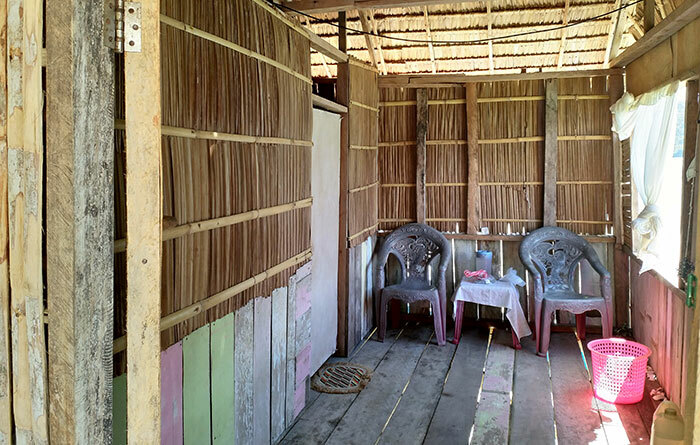 The shared bathroom is actually in its own separate hut behind the three room bungalow. The floor is some variety of crushed coral, not wood or cement. 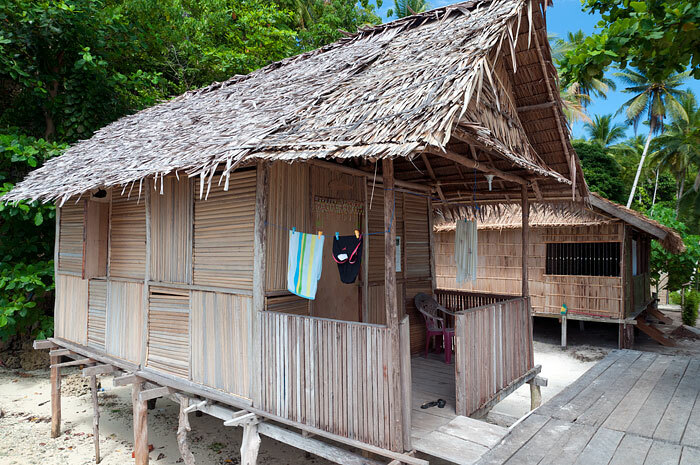 As with most of the homestays in Raja Ampat, there is no shower but buckets of water are kept full for washing. We had noticed when reading many of the reviews posted on the Stay Raja Ampat website that the food at the homestays was a source of frequent disappointment for travelers and while it is generally very similar fare day to day, we found everything quite tasty! Nyandetor served breakfast, lunch and dinner. Bananas were also available at any time. Breakfast typically consisted of some sort of lightly sweetened bread (donuts, cake etc.). Lunch was usually fish, some variety of vegetable and rice or noodles. Dinner was very similar. About mid-way through our stay a guest arrived who was a vegetarian and after his arrival we also frequently had dishes with tofu or tempeh. All in all, the flavors were quite good and the portions very sufficient. One thing that was somewhat surprising to me was the general lack of fruit at the homestays. There is a market at Waisai where fresh fruit can be purchased. 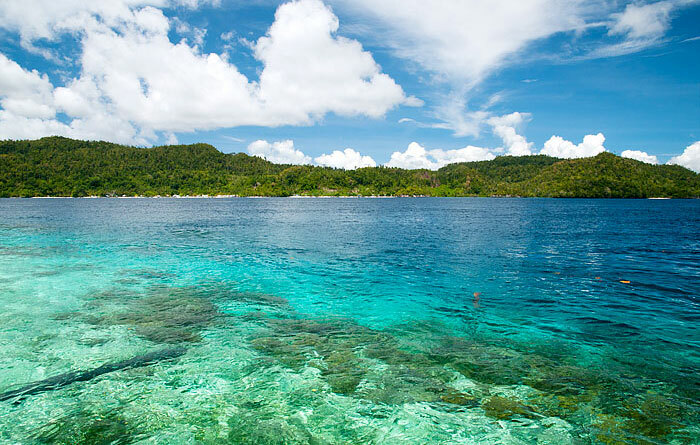 On our next trip to Raja Ampat, we will definitely visit that before leaving Waisai for our homestays. We noted in our review of Rawe Rawe that rain seemed to always miss the islands on the north side of Batanta and be falling elsewhere. Staying at Nyandetor, we found where that rain was typically falling. Nearly every afternoon, we would have a short rain shower. On only one occasion was it significant and that event seemed very widespread; I’m sure it was pouring buckets on Batanta as well. Apart from the afternoon showers, the weather was perfect. Several Indonesians we had met indicated that February was a great time to visit and we found that to be very true! Friwen Wall: Friwen Wall is actually part of the neighboring island. It’s a very quick boat ride to the wall and fairly inexpensive. It is also a “must see”. 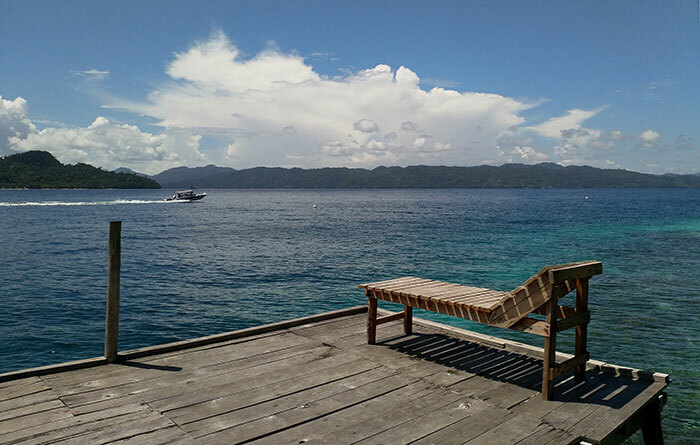 It’s listed as some of the best soft coral in all of Raja Ampat and while my husband and I did not snorkel broadly enough to judge fairly, several of the other guests had snorkeled extensively on Kri, Arborek and Mansuar as well as at Pianemo. All of the guests agreed that the Friwen Wall was one of, if not the most, beautiful soft coral they’d seen anywhere. We also saw puffer fish, octopus, lobster and a sea snake! Definitely make the time and go! Manta Sandy: Go! Period. Swim with the mantas. Both my husband and I swam beside mantas for significant stretches and it is one of those life memories we’ll never forget. We went in the morning as recommended by our hosts and went as snorkelers (not as divers). As many of the reviews note, we seemed to have more direct interaction with the mantas than the divers who were below us. One word of caution. There were significant currents at Manta Sandy. Staying in one place overtop the mantas while they were nearer the bottom was real work. If you’re not a strong swimmer, get some practice in before you go. Mansuar: Our hosts took us home from Manta Sandy by way of Mansuar. They brought some food for the fish and then took us snorkeling off the dock at a village on the south side of the island. It was a fun and unique experience. Fish swarmed us for the food and many of the fish were quite large. Snorkeling out farther we also saw cuttlefish and even schools of barracuda. Batu Lima: Batu Lima is visible from the dock at Nyandetor. It’s a rock formation at the mouth of the Kabui Bay passage. The coral on and around Batu Lima is exceptional. By contrast to Friwen Wall, it’s largely hard coral and its scale is immense. We snorkeled the passage opening near the rock formation and then asked our host to take us farther west along the southern edge of Gam where one of the other guests had snorkeled the day before. That was where we saw sea turtles! It was amazing! Definitely add Batu Lima to your trip itinerary! Bat Island: One of the nearby islands is a designated bat sanctuary. Our hosts offered to take us there one afternoon as a “bonus” which we obviously accepted! The island was beautiful but unfortunately, the bats were uncooperative and didn’t show. It’s likely that they were further inland but we hadn’t brought appropriate footwear so we contented ourselves with snorkeling around the island. The coral there has definitely seen damage but there were some of the most enormous schools of fish surrounding that island that we had seen anywhere. Also, the bright blue star fish were ubiquitous! Interestingly, this was the only place in Raja Ampat that I saw the crown of thorns starfish. Birds of Paradise: The homestay connected us with a family member named David who was our guide and “bird caller”. He picked us up at 5:00 a.m. while it was still dark and we crossed the channel between Friwen and Gam, entering a quiet bay and finally arriving at a small dock. From the dock we started what would be nearly an hour climb. We were provided with walking sticks, but even with the sticks, this trek isn’t a “walk in the woods”. You are in fact climbing to one of the island’s peaks. You will find yourself on the edge of fairly steep drop offs with only (fairly wobbly) bamboo rails to keep you on the trail, you will encounter all sorts of large creepy-crawlies and you’ll do all of this in the dark. And when you reach the top and see the birds of paradise play in the trees at dawn, it will all be 100% worth it! We were able to watch the male try to woo his ladies for nearly an hour. While the birds of paradise showed off their beautiful plumage, we also saw two enormous cockatoos swoop above our head as well as several large parrots – one bright green with shocks of red under the wings and one that was a deep crimson with blue or purples markings. It was stunning! We were definitely tired at the end, but David was an amazing guide and we had purchased binoculars for the trip so we were able to see everything in living color! Nyandetor is directly connected by a small path with the village at the center of Friwen Island. The people are extremely friendly and we walked frequently from Nyandetor, through the village, to the beaches on the far side of the island facing Friwen several times. The sunsets on that side of the island are stunning! Overall, the experience at Nyandetor was exceptional! The hosts are accommodating and eager to please. The location is excellent as it offers easy access to several “experiences” you don’t want to miss! In addition, while not as remote as Batanta, it was really special to be so near the village and having the other guests to share the experiences (as well as the cost) helped keep our entire trip more budget-friendly. We can definitely recommend Nyandetor without reservation! 3). Bartering is a way of life in Papua. In preparing for the trip we noticed that the Stay Raja Ampat website had quite a few traveler reviews indicating that the prices charged onsite seemed to vary from what was listed online. We also found that to be the case. It was also clear that Western guests from cultures where bartering is not common often felt the price discrepancy was the hosts trying to “rip them off” since typically they didn’t discover the difference until check-out. Making sure that all parties have agreed upon prices up front is key. 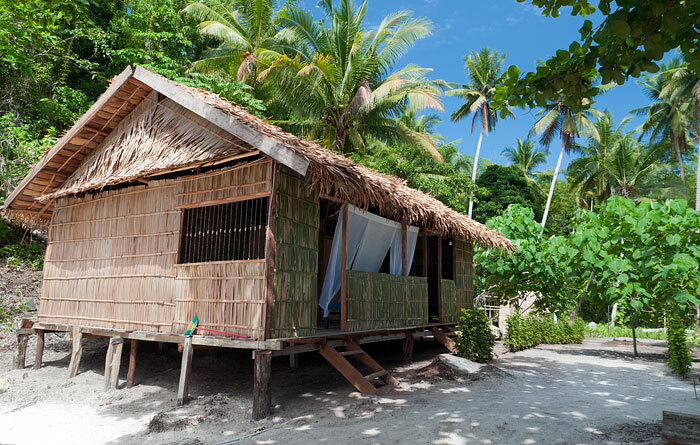 Language barriers can make that more challenging but, as the Stay Raja Ampat website suggests, a phrase book can make an enormous difference. If you feel a price is too steep, say so. Since Nyandetor was our second homestay, we were starting to acclimate to bartering by the time we arrived and were easily able to negotiate prices upfront that were both considerably lower than what was initially quoted and also provided the hosts with a nice profit margin. To summarize: ask for the cost up front if it’s not pre-disclosed. If you feel it’s high or more than you budgeted, be polite and let them know. Our experience indicates they expect a little bartering and don’t take a little push back personally so long as it’s done with courtesy and a smile. 4). 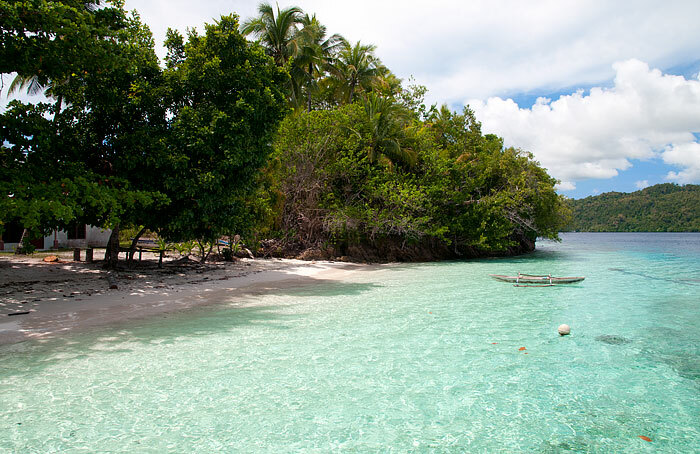 The Stay Raja Ampat website indicates little English is spoken at Nyandetor and that is accurate. That said, between my very broken Indonesian, their English and our phrasebook we were able to communicate fairly well. So please, don’t let the language barrier stop you! Just bring a phrase book! 5). 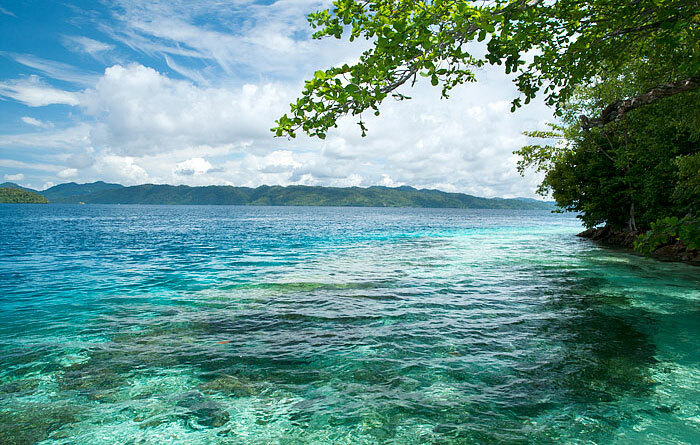 While preparing for our trip we read many reviews and blogs that referenced the currents in Raja Ampat. While we were fortunate enough not to encounter any situations where we felt in danger, it was very clear that your best resource and the best way to stay safe is to take the advice of the locals. One of the guests who stayed with us was a very good swimmer and decided to swim the channel between Friwen and Gam. The following morning a second guest, also a life-long swimmer, decided to follow his example. That morning the currents were far stronger and it was clear that making it to the other side was going to be much more difficult! In the end, the hosts jumped in the boat and picked the guest up as they were clearly very concerned. So be respectful of nature. Ask questions and follow your hosts’ advice. Nous avons passé 3 jours au Nyandetor Homestay du 12 au 15 février 2018. La famille était tout à fait accueillante (même si la dame qui fait la cuisine ne parle que papou, pas indonésien!). Tout était propre et les repas abondants. Nous ne nous sommes pas du tout sentis isolés car il y avait pas mal de clients. Le snorkelling juste devant le homestay est très intéressant. Le site est tout près de Friwen Wall que nous voulions revoir tellement c’est magnifique. Nous sommes aussi allés à Batu Lima qui est très beau aussi. Nous avions un accompagnateur qui venait snorkeler avec nous à chaque sortie et cela change tout car, grâce à son oeil exercé, nous avons vu plein de choses que nous n’aurions pas forcément remarquées, en particulier un assez gros wobbegong que nous n’avons revu nulle part ailleurs. Quiet and relaxing place right next to local community. Feels like your granny village house. Located at nice beach with small coral garden. No diving, just snorkeling. No internet connection. Food little bit limited, but very tasty and cooked with great care and love. We can recommend this place for couples who don’t bored together and for person who want be alone. Incredible location on a beautiful island. We saw dolphins as the description had it. Just peering off the pier we saw a school of cuttlefish! Wish we could have stayed here more. The food served was very tasty – food is hard to source on the islands, so you have to expect variation in what you are served but the family always tried their best and we were always satiated (and quite often dazzled). Would love to be back. Hausriff und die Friwen wall sind einfach klasse. Friwen was lovely and the snorkelling spectacular. However the hosts were not ready for me. Food was very limited and I left early. They did not seem interested ? 3 days for the begining of our stay in this archipelago, 3 days very amazing, because all here it is new and…breathtaking!!! Lobert and is family are attentive and Lobert is a great guide. With him we approched dolphins, we snorkelled in incredible places, he brought us to desert beach and show us particular lagoon. It was marvellous. Thank you very much Lobert and his mum!!! We (couple) stayed 4 nights in nyandetor. We really appreciated the family hosting of Tina, Lobert. Homestay close to the village is a very quiet place and is valuable to stay. We did 3 snorkellings with lobert , friwen wall (really nice coral), mioskon (first half is really fantastic, the second half is not interesting, enjoy time on the first half, stay it). Lobert is a nice person. Lobert ask sometimes an add-on for benzine. Normally price list includes benzine , no ?? Thanks for taking the time to write a review and nice to hear you enjoyed Nyandetor. :) You are correct – the prices we have posted above should include fuel. It has been a long time since they were provided to us though – it could be that Nyandetor have since raised them and haven’t passed that information along. We’ll do our best to check! Price list in nyandetor homestay (it is real positive they have it) is exactly the same published in stayrajaampat. I guess it is just non official addon.. Very nice place near the village. Beautiful reef for snorkeling, especially Friwen Wall. Host family – Tina, Marta, Lobert, Rio and Neles – very friendly and helpful. Thank you Tina for festive Easter together with you. Stayed here end of ’16. Family are typically friendly, helpful, local hosts. Whales, friwen 10 mins away, good food, excellent snorkeling. All good. Loved it. Wanna go back. Can’t. Too many other bloody spots. Then again…..
We began our 4 weeks R4-Trip with a 5 days stay at Nyandetor Homestay. Nyandetor is close to the village on Friwen and located at its own private beach. 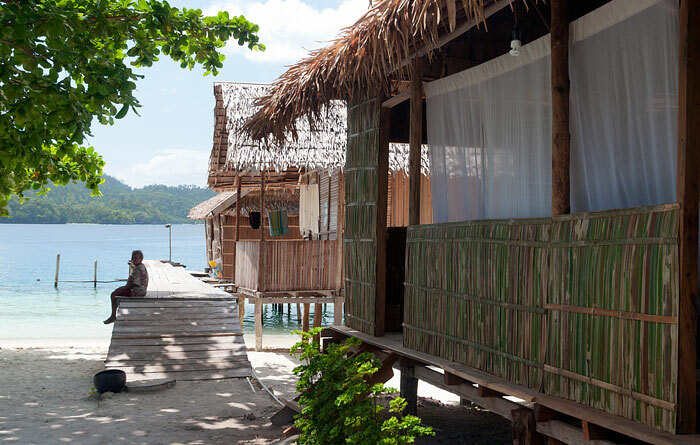 One bungalow and the dinning area are located over water on the jetty of the homestay. From the jetty you can see many fish and corals day and night. It’s a nice place to sit and relax. We really loved our stay with our very friendly hosts. Although we speak as much bahasa indonesia as our hosts speak english (almost none) we were served very good vegan food in a nice variety. The bungalows, bathroom and dining area is clean and looked after and even the beach was raked clean, when necessary. We really loved our stay there and rate it as one of our bests there. – we were nudged to do some extra activities a little too often (we did two). – For an extra trip to waisai, we had to pay twice the price of the pickup, although it is the same trip for the boat (we did not complain tho, due to communication difficulties). We stayed two nights and were well looked after. We loved the view from the restaurant looking out across the strait and watching dolphins cruise by the jetty. Nyandetor is well placed for snorkelling Firewan Wall. Thank you Robert and Ibu Tina for your kindness and hospitality. How did you do to make contact with them. so can I booking without paiment ? You can. (Although that will probably change in the future.) Full info about how it works is here. I try to book but when I select my date it’s write the check out date must be after check in date so my dates are ok 12/17 to 12/22 . I don’t understand please could you help me ? You should be able to simply click or tap in the date field to bring up a calendar, then just select the date you want. Um – check your email. I can see a successful booking request from you. An acknowledgement email was sent by the system an hour ago. It’s a very nice place to spend a couple of days/nights. Snorkeling at nearby Friwen wall was excellent. We stayed in Nyandetor only 3 days, but would have liked to stay much longer. The place is really romantic, perfect for the start and – like for us – the end of a R4 trip. The beach invites you just to relax, the village is very nice and friedly, a good toko is just around the palmtree-corner. Great snorkeling too, don´t miss friwen-wall and the surrounding area (mioskon is more for fish than coral, ask Otto about the dugongs in the morning around his little island near the wall)!! The family, Yance, the ibu, the kid´s and – for the tours – Otto, are warmhearted hosts. The place is very clean and wellkept, ibu cooks very good, often two kinds of veggis (terong/kangkung/pepaya). When we were there we had no problem whith mosquitos or sandflies at all, and the dogs were not too bad… Highly recommended – we also miss Rio!! Thanks for all! I am a scared of dogs when they are barking / jumping at you – can you give any more information on this at Friwen? Were they being territorial and barking at you if you walked through to the village? And did the dogs also come down to the homestay much? Any further insight would be welcome, as we went to Arborek last year and there was a very territorial angry dog by the jetty which made it completely off-putting to snorkel from it (best part of Arborek! )… It was also uncomfortable in the homestay at night as there were a few dogs hanging around the homestay and (with the door not being secure), we felt a bit nervous at night as well. 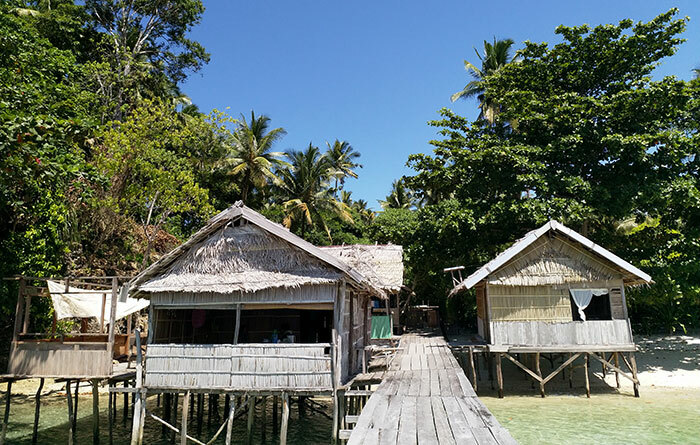 we stay in raja ampat the second time and have visited about 6 homestays. the family does not speak any english, but they organice a ” translater ” in the village if neccecary. they take care for your belongings. nice hosts. 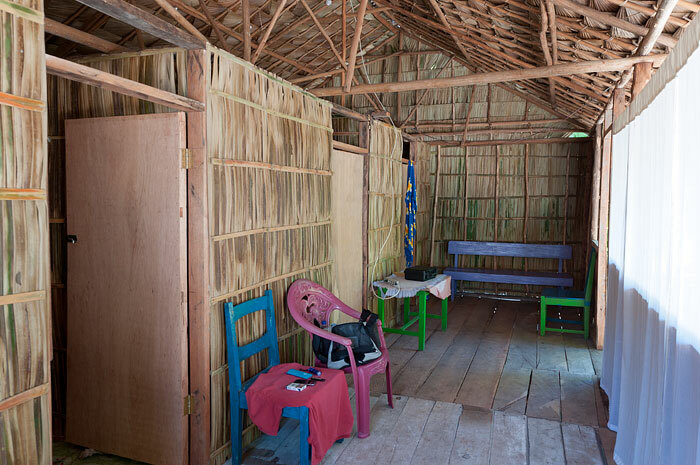 the homestay was made with more care and love than others. very clean toilet and shower. lovely and clean dining room with view over the water. a nice short jetty to stay, as well as a small lovely beach. we saw wales and dolfins, as well as hunting tunas nearly every day. the food was very good. fish sometines the small ones, but with a good taste. not perfect: there seemed to be a little bit more moskitos and sandflies then on other homestays. some more dogs, even from the village. therefore also sometimes loud at night. never the less: highly recommended. Staying for the whole week with Teddy, great snorkeling spot, diving paradise, and upfront sandy beach truly an amazing experience for us. Overall we love to stay in Nyandetor, Pak Yance and family are very welcome host and i already missed Rio their youngest son that accompanying us along the stay. The food is great, fresh from the sea. Will coming back for sure!